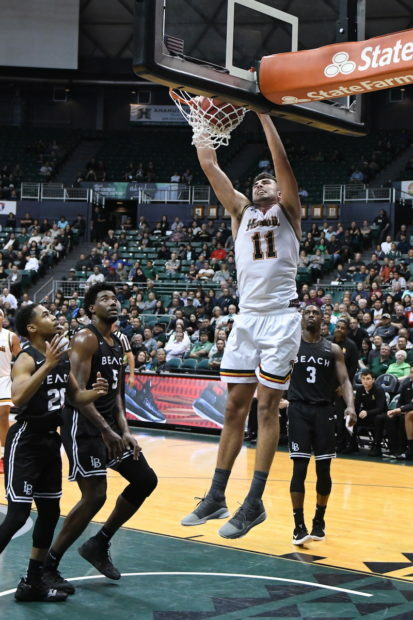 Brocke Stepteau scored 16 points with five assists and Eddie Stansberry added 14 points and five rebounds tonight to help Hawai’i pull away from Long Beach State, 74-57, in Big West Conference men’s basketball action. A vocal Stan Sheriff Center crowd of about 4,200 watched Zigmars Raimo add 11 points and eight rebounds as the Warriors improved to 13-7 overall and 4-2 in league play. Mason Riggins scored 18 points and Deishuan Booker added 14 points for the 49ers, who fell to 8-14, 2-4. Long Beach State jumped out to an 11-2 lead in the first five minutes but UH responded with a 13-4 run and tied it at 15-15 on Stansberry’s 3-pointer from the right corner. Soon after, Stepteau scored on a three-point play to put the Warriors ahead got good at 18-17 with 8:48 remaining in the half. Hawai’i led 36-28 at halftime, and after the 49ers closed it to 41-40 on Riggins’ layup with 15:08 left, the Warriors later went on an 8-0 run to stretch the lead to 57-47 on Buggs’ three-point play with 8:19 remaining.